Valentine Holmes has done it. 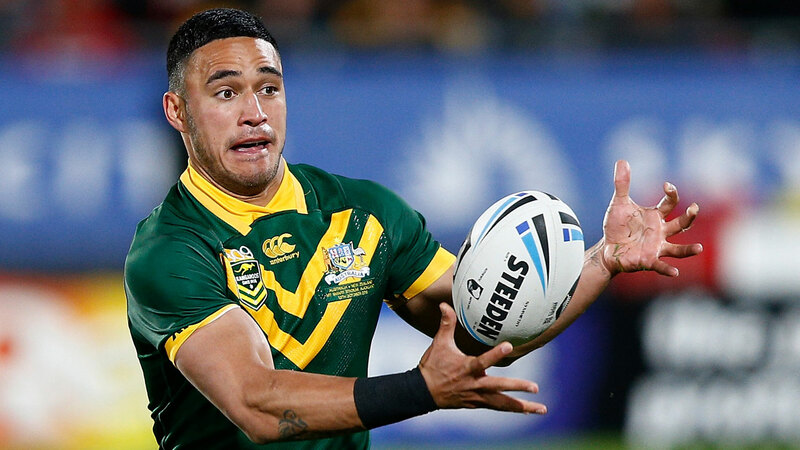 The NRL star has secured a deal in the NFL, signing with the New York Jets. So, how did it happen? And what’s next? For starters, it's clear that the NRL superstar is not doing this for the money. Here is what we know so far about some key points. HOW DID THE JETS GET HOLMES AND HOW DID THEY REACT? Holmes received a call from Jets general manager Mike Maccagnan at about 8.30am AEST, telling him that he would be joining the NFL franchise. The former NRL star happily accepted. 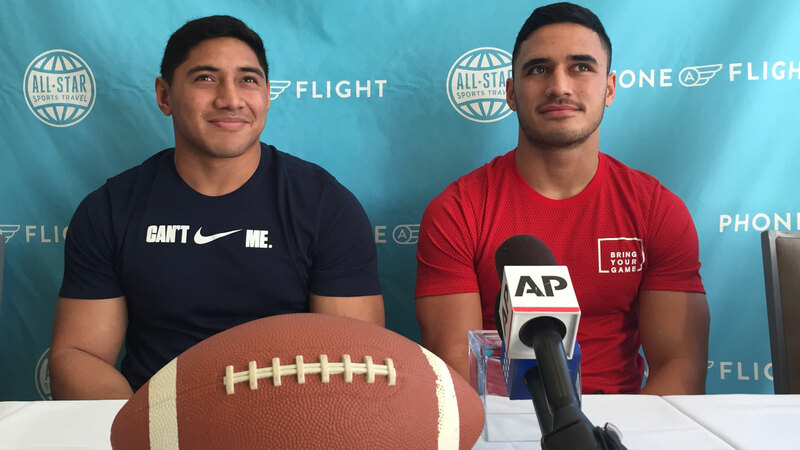 The Jets – along with the Patriots, Dolphins and Bills – were chosen at random to receive a player this season through the International Player Pathways program, an NFL initiative designed to offer talented non-US athletes a shot at American pro football. 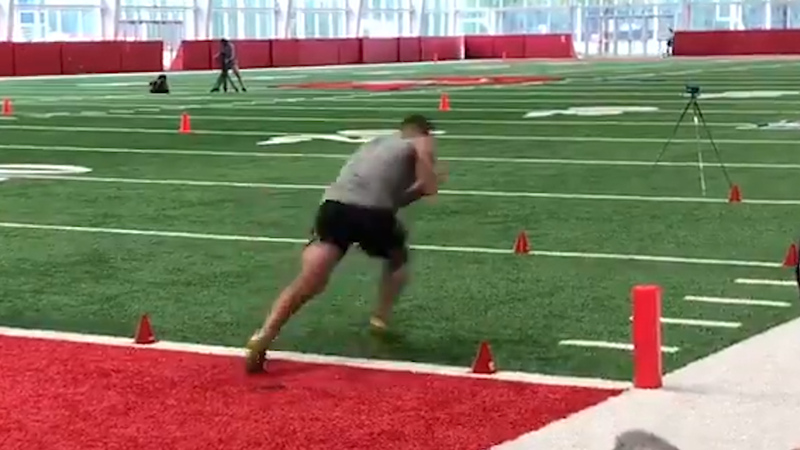 Holmes enrolled in the program and impressed at his pro day workout in front of scouts for the NFL’s 32 teams, running 4.45 in the all-important 40-yard dash. New York must have liked what they saw, though Holmes is also something of a freebie player; he can be carried as an 11th member of the practice squad, an addition to the usual 10-man limit. Holmes has been given a 12-month deal, according to his management. When he returns to the US, he will take part in training camp and organised team activities with the Jets, on top of his own personal pre-season preparations. Holmes already has links, somewhat, to the Jets; he worked out at the IMG Academy under coaches that included the team’s former running back Leon Washington and former linebackers coach Jim Herrmann. Australian punter Lachlan Edwards is on the Jets roster. The NFL club’s website, newyorkjets.com, made the standard US error in explaining Holmes’ background to fans, calling him a 'rugby' player. “He represented Australia in the 2017 Rugby World Cup, scoring five tries (touchdowns) in the quarterfinals and then six tries in the semis,” a report on the site said. Rugby league remains a foreign concept to Americans, apparently, though all the other information was correct; Holmes did run-in 11 tries in two games in that RLWC, against Samoa and Fiji. WILL HOLMES GET TO PLAY? Holmes will play in the Jets’ four pre-season games, according to his management, which are played in August ahead of the regular-season kick-off in September. New York's opponents will be named this month. Fellow NRL star Jarryd Hayne used pre-season games to launch an extraordinary bid for the San Francisco 49ers’ 53-man roster in 2015, starting with a 53-yard run against the Texans. He impressed further in the next three games and made the roster as a running back and punt returner, playing eight NFL games, including the season opener. Holmes will hope to produce some similarly eye-catching moments to plant the seed with his team that maybe, just maybe, he’s worth a spot on the roster rather than just the practice squad. At this stage, that is his lot. He has been signed as a practice squad member and the Jets will closely monitor his progress to see if he is worth persisting with. A player can remain on the practice squad for three years. Holmes faces huge odds to make the 53-man roster in his first season and an even greater challenge to make the cut for a 46-man game day squad. Hayne proved that anything is possible, if Holmes displays the kind of skills that made him a standout in rugby league, but the mountain facing him can’t be understated. The big question will be whether Holmes, still just 23, is willing to spend time persisting in practice squad purgatory when he could be starring in the NRL. In an interview with Wide World of Sports’ Melanie Dinjaski during February, the former Kangaroos star insisted that he would not make a hasty decision to quit if things didn't go his way. "I just want to get into a team and train my a--- off and show them what I can do," Holmes said. "If that means I have to be on a practice squad and bide my time, then so be it. "Obviously the main goal is to pull on a jersey week in and week out on Sundays, but I wouldn’t have moved this whole way to do this half-hearted. I’m here to give it a 100 per cent crack and try my best in everything I can do. "My main focus is to give it my all and to be able to play next season, if not the next." WHAT POSITION COULD HOLMES PLAY? The running back and punt returner combination that Hayne offered the 49ers would appear to be Holmes’ path to the NFL. He has also been listed as a wide receiver by the Jets. At 185cm (6'1") and 90kg (198lbs), Holmes is a similar body shape to Hayne, albeit about 10kg lighter. He has been working to increase his strength and size since leaving rugby league to train in the US. Running back is less complicated than other NFL offensive positions, given much of the job is simply to find space and run into it as hard and fast as possible. Holmes would also have a somewhat familiar view of the game, running at a defensive line and looking for broken play. Yet like Hayne, Holmes would face the challenge of bulking up significantly, improving his speed and also adapting his running style to become lower and more compact. Running too upright was a constant issue for Hayne, as a high runner presents a bigger target to ruthless NFL defenders who are always looking to force a fumble. Another issue Hayne grappled with at running back was blocking responsibilities; protecting the quarterback, who may be on $20 million per season, from defensive blitzes. Hayne missed a number of defensive assignments during his time at the 49ers and such failures are not viewed favourably. Running back is also a difficult position to crack, given the mass supply of elite athletes in the US who can fill those roster spots relatively cheaply, and with far greater football experience than Holmes will ever have. RB is no longer seen as a glamorous job, if it ever truly was, while punt returning is waning in relevance and kick-off returns are veering towards extinction. The top of the RB pecking order is already sorted at the Jets, after they signed star Le’Veon Bell in the wake of a bizarre fallout with the Pittsburgh Steelers that saw him sit out the entire 2018 season. Last season’s top running back for the team, Isaiah Crowell, has moved to Oakland. Trenton Cannon is on the Jets roster, after an unremarkable rookie season, plus third-year player Elijah McGuire. Holmes told foxsports.com.au that learning from Bell, twice a first-team All-Pro player, was an exciting prospect: “He’s obviously a world-class player, he’s really talented, and I feel like he’d be someone good to learn off and someone I could try play my game as." The Jets have also just lost their specialist returner, All-Pro wide receiver Andre Roberts, who has signed with Buffalo. Roberts topped the NFL last season with 40 kick-off returns for 1174 yards, and was second for punt return yards with 324 yards. Wide receiver is a position that Holmes could potentially suit, with his body shape, running and catching skills. It would seem a natural fit for an elite rugby league winger/fullback. Yet wide receiver – or alternatively, playing as a corner back – brings vast new sections of the playbook into calculation. Rather than simply running the football, a player is expected to perfectly execute precise running routes in order to present an option to his quarterback. Hayne admitted to struggling with the enormous NFL playbook, even as a running back at a team not renowned for its offensive complexity. Another possibility, though it would require Holmes to shelve glorious dreams of running in touchdowns, would be to play as a safety. Again, the backfield defensive position would give him a somewhat familiar view of the game and he could utilise his experience tackling runners in broken play. Holmes previously backed away from the idea, telling WWOS: "I’m probably more of an offensive player I think. I don’t really like to tackle." HOW MUCH WILL HOLMES BE PAID? Holmes was looking at $800,000 per season to stay in the NRL; the Cowboys had reportedly offered $4 million over five years and the Sharks a similar figure. He could also make around $200,000 extra during busy representative seasons, with $40,000 match fees for State of Origin games and $20,000 per Test, putting his football earnings at around $1 million per year. As an NFL rookie, Holmes would have to take far less than that, even if he enjoys remarkable success. For the 2019 season, first-year players receive $US1,150 ($1,615) per week during pre-season. The minimum wage on a practice squad will be $US8,000 ($11,229) per week; $US136,000 ($190,893) across the 17 weeks of the season. A practice squad spot may be Holmes’ most realistic outcome and it would mean a pay cut of about $800,000 per season in his first year. Should Holmes emulate Hayne by making a team's 53-man roster, the rookie minimum salary for 2019 is $US495,000 ($694,743). Even with a favourable exchange rate for an Australian earning US dollars, Holmes would be sacrificing about $300,000 per season. Holmes would be trying to earn a reserve/futures contract, given to players with potential by NFL clubs who wish to stash them outside of the salary cap. Those three-year contracts rarely contain any guaranteed money, can be torn up at any time and only pay a player his wage when he is on the active 53-man roster; otherwise, he makes the relative pittance of a practice squad member. There are 17 active weeks in the 16-game NFL regular season and players earn their salary in-season, meaning they are paid 1/17th at a time. Should Holmes force his way in, his weekly wage would be $US29,118 ($40,864). If Holmes realises his dream and becomes a serious NFL player, millions of dollars beckon – Bell signed with the Jets for $US52.5 million ($A74m) over four years. deal with the Jets. But for the Australia, hitting that kind of elite money is a big if. HOW MANY AUSTRALIANS HAVE PLAYED FOR THE JETS AND IN THE NFL? Thus far, 16 Australians have played in the NFL. Holmes and Philadelphia Eagles offensive tackle Jordan Mailata, also a recent rugby league convert, are vying to become the 17th. As position players rather than punters, they would be rarities. Holmes is also attempting to become the fourth Aussie to play for the Jets. The Australian NFL honour roll is as follows.